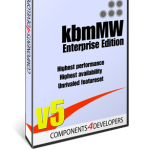 ANN: kbmMW Professional and Enterprise Edition v. 5.02.00 released! Please look in the end of this post for a detailed change list. CodeGear Edition is available for free, but only supports a specific Delphi/Win32 SKU, contains a limited feature set and do not include source. hospitals, courts, private, industries, offshore industry, finance, telecom, governements, schools, laboratories, rentals, culture institutions, FDA approved medical devices, military and more. access to the data is slightly different. Use AsObject to return a reference to the object. Ownership of the object belongs to the TkbmMWAutoValue container. Use AsMyObject to return a reference to the object and mark it as your object. You will be responsible for freeing it. – Added IkbmMWAutoValue and TkbmMWAutoValue to kbmMWGlobal.pas. They handle scope based object life time handling. – Changed smart object’s (TkbmMWMarshalledVariantData) to use TkbmMWAutoValue. – Updated DumpVariant in kbmMWGlobal.pas to dump smart object’s too. – Added support for TkbmMWTiming on IOS. parent object, and if the result should be prettyformatted or not (default). Prettyformatting is not implemented on JSON at the time. should support them, industry dont, why most AMQP implementations will not understand those types. – Updated kbmMWAMQP.pas to support copying field tables instead of assigning them. digits and characters that can be visually misread (0 vs O etc). TkbmMWCUstomSAFServerTransport and published in descending classes. unable to decrypt a message. – Added support for dynamic arrays in object marshalling. the client will be notified about the value in that particular field. – Modified and fixed timezone initialization in kbmMWDateTime.pas. attempting various keys before finally either succeeding or giving up. This can be valuable in supporting client unique encryption/decryption. returns a default value if the property/index is missing instead of raising an exception. knows that index names must be database scope unique, instead of only table scope unique. – Added Init function that accepts a string as salt to TkbmMWCustomHash. – Added GetDigest to TkbmMWCustomHash, which returns a byte array with the digested hash. Its an alternative to using Final. – Added OnDisconnected and OnException events to TkbmMWAMQPClientConnection. – Added OnConnect, OnDisconnect, OnDisconnected and OnException events to TkbmMWAMQPClient. – Added mwsloDateTimeIsUTC to TkbmMWSQLiteOption. Determines how to interpret date time values, as local time or as UTC time. – Added support for boolean parameter values in TkbmMWSQLite. – Improved marshalling of kbmMWNullable types. – Added support for TIMESTAMP datatype in SQL datatype deduction. – Added support for returning an interfaced object from smart services. – Added field change detection to TkbmMWFieldDefs. – Improved TkbmMWRTTI.InstantiateValue in kbmMWRTTI.pas. – Added methods ToDataset, FromDataset, ListFromDataset to TkbmMWSmartClientORM. Provides an easy way to convert arguments and results to and from datasets. to give an alternative way to provide cron like schedules. provide an anonymous function to be called after the schedule has run. followed up with updating something with the result of the function. – Added TkbmMWONSchedulerStorage for storing/retrieving schedules in any object notation format. – Added support for subscribing for raw messages using anonymous function in WIB. – Added Delete to TkbmMWORM taking primary key values alternative specific field values. – Added support for many more date formats for ORM data generators. UTCSINCEEPOCHMS, LOCALSINCEEPOCH and UTCSINCEEPOCH is supported. – Generally many additional improvements on ORM. – Fixed default true/false values for TkbmMWSQLiteMetaData. – Fixed HTTP/REST/AJAX additional incorrect CRLF in output. – Fixed serious bug in 32 bit random generators (kbmMWRandom.pas). – Fixed NextGen issues in some parsing routines in kbmMWDateTime.pas. – Fixed bugs in Query service wizard. – Fixed some SQL rewriting bugs including adding support for DESCENDING order by.